How can you climb the Matterhorn? Photo: Alex Messenger. 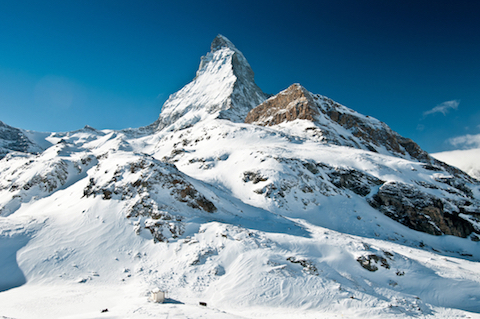 The Matterhorn is surely the world’s most iconic peak. Its commanding, isolated position at the head of the valley is unique in the Alps and its claim to being one of the world’s most beautiful mountains is justified. Mountain Guide Tim Blakemore offers his top tips on reaching its summit successfully. As well as beautiful, the Matterhorn is also steeped in history tinged with tragedy. The first ascensionists’ joy was short-lived as four of the party fell to their death on the descent. It is a unique mountain and tactics to climb it successfully must be matched accordingly. Unlike many of the bigger peaks in the Alps (on the Hörnli ridge at least) there are no crevasse, serac or avalanche hazards. Complicated route-finding, altitude, rock fall and sheer length (1,200 metres) make it a significant challenge however. 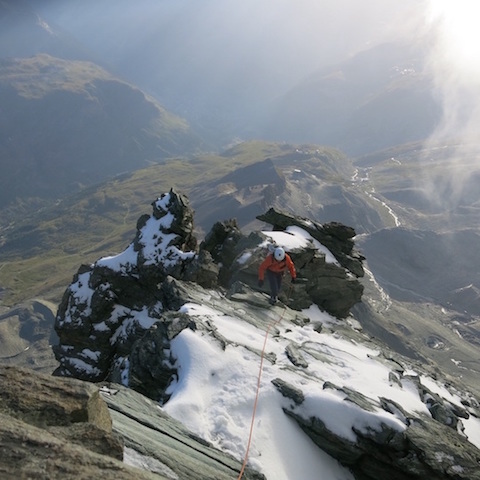 There are four routes up the Matterhorn which are climbed relatively regularly. All can be climbed from Zermatt. 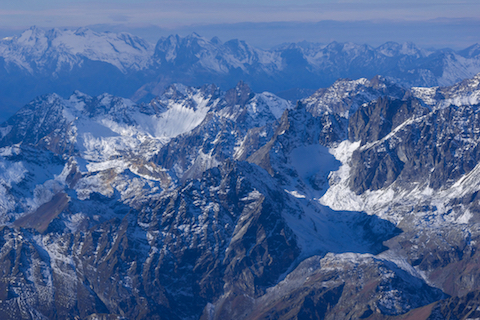 By far and away the most frequented is the North-East or Hörnli Ridge (AD III-). This was the line of the first ascent and it is not unusual to see 100 mountaineers per day attempt it in the summer season. The other three routes are the South West/Italian Ridge (or Lion Ridge) AD+ III, the North-West or Zmutt Ridge D III+ and the classic North Face or Schmid Route TD. You need to be able to sustain physical effort and be in control (particularly down climbing) for 8-12 hours on Grade 2 or 3 scrambling terrain. 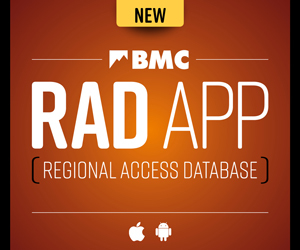 Mileage gained in the UK is invaluable and days spent linking scrambles to mimic this type of effort will pay dividends. Areas like Snowdonia or the Cuillin Ridge are good examples. 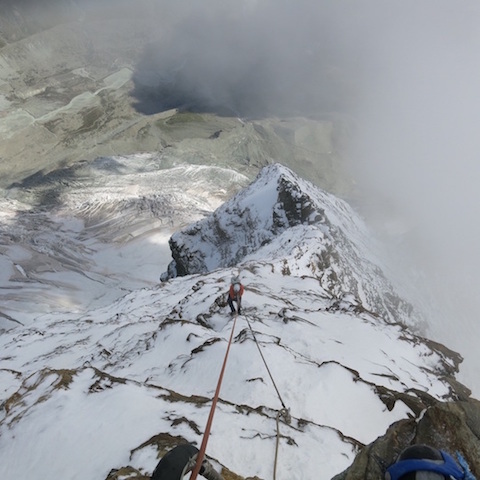 Many British Guides now offer this type of training – make sure your guide knows the Matterhorn so they can advise on specifics and can give real anecdotal advice. Experience of using crampons is essential as the top third is often snow covered and can be delicate in descent. At 4,478m you will need to be acclimatised otherwise you will grind to a halt at best. At worst you are at very real risk of Acute Mountain Sickness (AMS). A period of acclimatisation, of around four or five days including sleeping at altitude (the classic way is to climb on the Italian side of the Monte Rosa massif) is a minimum. Being ‘determined’, ‘strong willed’, and ‘not a quitter’ are no substitute for fitness. Mountains are a great leveller and the Matterhorn doubly so. Make sure you have put in the groundwork by going on long runs/hikes/scrambles. One of the most embarrassing and frankly dangerous things I have seen is a group of Brits ‘pitching’ their way up the Hörnli Ridge. Unfortunately they were off route so put every one below them at risk from rock-fall. Don’t import your ethics and tactics to the Matterhorn – it doesn’t work. Moving together is simply that – both climbers move at the same time with a short-ish length of rope using intermediate runners and short pitching where necessary. This takes a lot of time and training to perfect and is the technique used by alpine guides with their clients. At 1,200m it is an essential technique and one you must be efficient at, both in ascent and descent. Don’t abseil. There are the odd spots (the Moseley Slabs and the Gebiss) which are abseiled but all other ground should be down climbed. You will invariably cause a traffic jam if you do try, knock rocks down and worse, get off route into dangerous, loose ground. 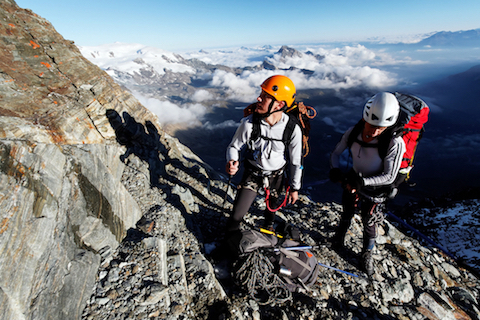 You don’t need a large rack to climb the Hörnli Ridge. Perhaps a few quick draws and the odd cam but otherwise a 40m single rope is enough. The Hörnli Ridge can be an intimidating place to be, surrounded by guides jostling for position. If you are unconfident or your techniques are not refined you will be left for dust (and therefore ‘going against the flow’ as they all climb back down on top of you as they descend). Zermatt is the valley base but is eye wateringly expensive. I prefer to acclimatise and train in France or Italy (the Eurozone) where things are a wee bit cheaper. Once acclimatised make your way to Tasch where you leave the car (or get there by train which is reliable). Once in Zermatt make your way to the Hörnli Hut via the Matterhorn Express, Schwarzsee lift – it's a two-hour walk. The Hörnli Hut is booked via hoernlihuette.ch and currently costs CHF 150.00 per person or CHF 450.00 for a double room. The ‘season’ is normally early July through to early September. Snow puts the route out of condition (dry rock is needed to move efficiently) and the local guides at the alpincenter-zermatt.ch are a good source of up to date information.